The “What if I’m not good enough” gremlins have taken over Marcel’s central processor. The kindergarten build up is sending my angelic sweet pea into the lead role of the Hot Mess series at the Mama C ville community theater. 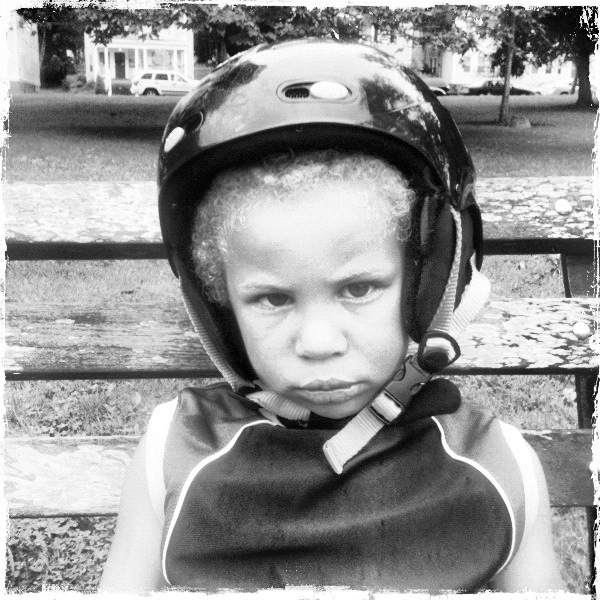 Tantrums barely describes the constant flow of tears, kicks, thrown objects (mostly at Sam-who should be wearing the helmet) and the all around refusal and chaos mode he seems most comfortable in. Yes, I’m reassuring him. The world is too. It doesn’t seem to be helping. Yes, I’m acknowledging his feelings, and trying hard to give him strategies to navigate the feelings (breathing deep, lots of rest, almost no sugar, tons of exercise). We’ve gone to the playground at the school a few times every week. None of this seems to be helping either. Tomorrow he meets his new teacher at his “screening”. This, I have insisted will help. “After you meet Mrs. Bindergarten and see your classroom you’ll feel so much better!” He seems skeptical. But if I had to start a new full time job, with little real knowledge of the expectations, place, colleagues or BOSS I’d be a hot mess too. Being the child of a demi-perfectionist/ control seeking Mama is not helpful at this time perhaps? We just got back from the library, and checked out every “first day of school” book we could grab. Overkill? In the car this morning he says; “Will I always be able to find my room? What if someone else is at my cubby?” We’re getting closer to harnessing the beast I’d say. Any other parents out there with some back to school jitters under your roof? What are your best strategies? What’s helped the most? Mea had a pretty good case of back to school jitters. Truthfully, after we went to open house the night before school started she was better. She started back last Wednesday, and even on Monday morning she was still nervous about finding her class room, remembering her lunch code and all of that good stuff. Things seem to be settling down a bit now, a few days into the new week. She is one who gets nervous at any “something new,” and doesn’t always show her nervousness in the best manner possible. I totally get it. We have lived this (Jupiter’s kindergarten year a lamp went flying accross the room the night before her first solo day in kgarten); and continue to live it, although the anxiety shows in some different and some predictable ways each year. This year in particular is highlighted by 13 former bug bite scabs that she picks off incessently, 3 slightly loose baby teeth that she’s pulled out in a 12 day time frame, ecezema and attitude. We do the same things that you’re doing. Particularly exercise. She’s a sensory seeker so we find ways to build lots of swinging and spinning into her day. That kindergarten year, we spent 90 minutes after the flying lamp composing and illustrating a play by play book of everything she would do in kindergarten the next day: arrival, circle time, special, snack, recess, lunch, etc; being as specific as possible. We also put in the book any adults she knew in the school she could go to if she got lost/scared/overwhelmed and a particular friend who was in her class that she could buddy up with at the same times. We tried to work with the very specific fears; like “If someone is at my cubby I can…” and then work together to put an action plan for that particular problem. The teacher was very supportive and gave Jupiter stickers to put on each page of the book as that particular “play” was accomplished. And some of it we just have to endure each year and hope that it will pass sooner rather than later. Preferably before the birthday/holiday time anxiety makes its appearance :). Dag! Ok. So it’s a universal and has many layers and manifestations! Sounds like you have very developed amazing strategies! I think today did help! His new teacher put him at ease immediately. For one thing– you sound like you are doing great and he sounds like he is doing exactly, precisely what he should be doing– showing his Mama how scared he is. For another, I am a big believer in two different strategies (or maybe this is three– we’re now about to find out how well I did or didn’t do with basic counting in kindergarten– simultaneously– but in any case more than one.) The problem with what I am about to write is that the two approaches are somewhat contradictory and it’s sometimes tough to figure out which to use when. But here goes. One is that I still think that as adults we forget how very much information young ones just don’t have. They have little bits of information but lack lots of pieces and end up filling in the gaps with fears or fantasies. I remember when my daughter was 4 she once said that she didn’t want to go to kindergarten because she didn’t want her teeth to fall out! So much there– that she didn’t understand that generally losing baby teeth isn’t painful or hard, etc. etc. and did she think that going to school was why one lost one’s teeth? I didn’t know for sure whether she was saying that or just that she was afraid of turning 5 for that reason. So we had a long talk that time about what it is like to lose your baby teeth, how you don’t lose those teeth because you are in school — but you do lose teeth starting at age 5 or 6 or 7– and that it would be ok…. But I was struck by how many things they have enough information to worry about, but not enough information to handle. So talk, talk, talk, information, information, information. On the other hand, I realize I often try to talk her through things that really shouldn’t be talked through. There is anxiety, there is fear, there is sadness and worry and she does just need a big meltdown– could be tears, could be fury– but she needs that release with me just loving her and confident that that is what she needs to be doing– not mad or trying to “figure something out”. My kids did not get too jittery but I found the first day of school books really helped.